Summary: We spend roughly as much on defense (broadly defined) as the rest of the world combined, the money feeding an organization of unique size and complexity. Now every aspect of DoD faces the need for radical change in response to the challenges of the 21st century. New threats, funding cuts, recruiting & retaining a new generation of Americans — amidst the tensions of the mad long war, and two failed occupations. Today Doug Macgregor reviews the Army Chief of Staff’s look at his service’s plans for the future. “Odierno pushes BCT revamp, must-have programs” — Subscription only. BCT = Brigade Combat Team. Army Chief of Staff General Ray Odierno outlined his priorities and perspectives during an exclusive interview with Vago Muradian, the editor of Defense News. In the exchange with Vago Muradian, Odierno is stating many of the things I did in 1997’s Breaking the Phalanx (BTP). Ultimately, Odierno is attempting to restore the Cold War army force structure with minor adjustments to brigades, improvements selectively lifted from the 1997 edition of BTP and the 2003 edition of Transformation under Fire. Unfortunately, Odierno is sticking with the smaller colonel commanded BCTs inside divisions to avoid any substantive change in organization, training or structure that would alter the WW II single service warfare paradigm and make the Army’s capabilities more available and relevant to Joint Expeditionary Warfighting. There are other issues worth noting too. Odierno’s assertion that he is aligning army forces with combatant commands is also a throwback to the 1990s when divisions were aligned with the two major war plans – SW Asia and NE Asia. In reality, the same divisions went to both fights because the Army lacked the strength to meet the demands of a near-simultaneous fight. Today’s “incredible shrinking army” is in a similar position. Worst of all, the Army remains in a state that is not suitable for or conducive to deployment. Force packaging is essentially unchanged. Breaking the Phalanx was written in 1997 to address these problems; to package army capabilities the combatant commanders said they needed and to align the army’s deployable combat power with Air Force and Naval expeditionary forces on joint rotational readiness for deployments. In addition, without a new force design that makes sense for the Army and the Joint Force, rapid prototyping a Ground Combat Vehicle (GCV, Wikipedia) won’t happen for use inside a new organization that the four stars don’t want. As usual, like his unimaginative predecessors in the Chief’s office since 1991, Odierno has decided to pass on all of these issues. By insisting on the unneeded colonel level of command, Odierno is also ensuring the slow, ponderous industrial age promotion system based on cronyism does not change. Large numbers of the commanders, (foreign and domestic) Americans worship in popular history books never commanded at the colonel level. Many of the most successful officers in WW II jumped from captain to Lieutenant Colonel and then on to Brigadier General and Major General without the benefit of the stultifying, mind-numbing experience of garrison command at the colonel level in peacetime. Meanwhile, the Army Chief of Staff probably thinks he’s hiding force structure from the Administration by converting brigades to advisory elements designed to train people in Africa, Latin America and the Middle East – a Special Forces mission. Odierno’s emphasis on everything but the readiness to fight enemies that can actually fight back with armies, air forces, air defenses and navies may temporarily endear him to the shrinking pool of nation builders on the left, but it’s also a prescription for future disasters on the 1950 Korea model — a disaster created by army four stars, not Congress. What Odierno forgets is that as the money dries up, Congress and the White House will fund what’s essential to fight and win. If Odierno stays on the current path, he will be lucky to keep 400,000 men let alone any real capability in the army, if that. Finally, the monstrous overhead in three and four star headquarters persists (eg: Army Forces Command, Training and Doctrine Command and Army Material Command), no new prototyping of equipment and units occurs, and the Army sinks deeper and deeper into strategic irrelevance. It’s time to jettison the self-defeating operations to suppress Muslims resisting occupation in Iraq — operations that put Iran in charge, not the United States. Directing air strikes, raids, check points or patrols against Muslim insurgents from the comfort and security of the Green Zone is not the future. It’s the past and a dead end at that. In 1871, the impact of similar operations over two decades against Mexicans, Berbers and Arabs left the French Army incapable of effectively fighting an enemy that could actually fight back, Prussia. Bazaine, the French Marshal celebrated by the Parisian Press for leading a failed expedition to Mexico in 1862 (an occupation remembered by contemporary Mexicans for its extreme brutality) is now remembered for his decision to surrender the last organized French army to the Prussians during the Franco-Prussian War. We don’t need to follow the French model into defeat, but, in truth, that’s the path we are on. The leadership of the Air Force and Navy are undoubtedly delighted since Odierno’s incrementalism and misguided insistence on extending the past into the future makes it easier for them to mine the army budget for money. It’s not over yet, but Odierno would profit from sending the retired Army four stars away and reevaluating the path they’ve put him on. Drawing water from the poison well is a time-honored practice inside the beltway. However, this time it could do more than sicken the Army. It could be fatal. Douglas A. Macgregor PhD. (Colonel, US Army, retired) is widely recognized as one of the most influential military thinkers of the late 20th and early 21st Centuries. 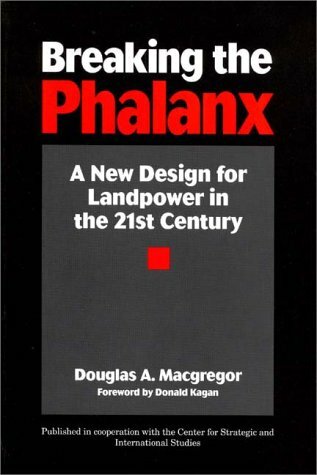 … Macgregor’s seminal work, Breaking the Phalanx: A New Design for Landpower in the 21st Century (1997) was the first book by an Active Duty military author since Brigadier General William Mitchell, U.S. Army Air Corps, to challenge the status quo and set forth detailed proposals for the radical reform and reorganization of U.S. Army ground forces. 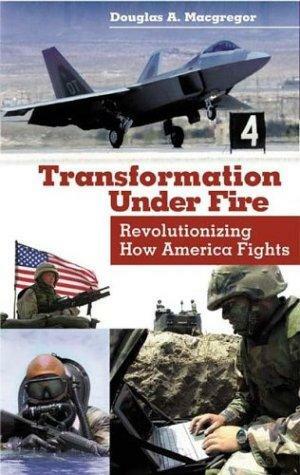 His follow-on work, Transformation under Fire: Revolutionizing How America Fights (2003) expands on the concepts and ideas for reform and includes a foreword by a former British four-star general, Sir Rupert Smith. … Macgregor is now an Executive VP with Burke-Macgregor Group LLC. 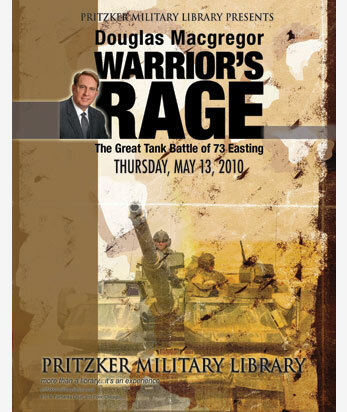 Macgregor sketches out the global geopolitical picture for us, 18 May 2010 — Includes links to many of his articles.